Not much to report on the bird front with just an overhead trickle of Swifts, Sand Martins and Yellow Wagtails whilst at least four Yellow-legged Gulls and two Mediterranean Gulls were feeding at the Patch. 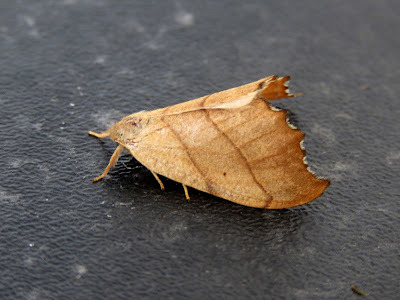 Moth-trapping was very productive with a Scalloped Hook-tip (3rd Obs record), Peach Blossom (6th Obs record) and the Fern (8th Obs record) of note. As well as moths the Viper's Bugloss is the host plant for to a variety of other insects. 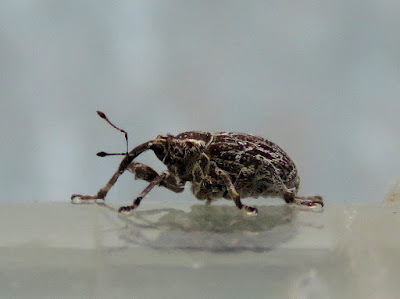 One of these is the weevil Mogulones geographicus shown below. Several were easily caught by sweeping the foodplant around the Observatory.